� Doherty's win in Seattle in August 2015 made him the tallest player to ever win an AVP title. � Entering the 2019 season, Doherty has played in at least one AVP final in each year since 2013. 2018: Doherty and Billy Allen teamed up for seven AVP tournaments with a best of second to go with a pair of thirds. Doherty ended the year third in both kills (7.05 per set) and hitting percentage (.491), sixth in aces (.76 per set) and seventh in blocks (1.42 per set). Internationally Doherty and Allen played five times with a best of ninth twice. 2017: Doherty and John Hyden played five AVP tournaments together, winning once and placing second once. Doherty ranked first on the Tour in kills (7.46 per set), second in blocks (2.14 per set), fifth in aces (1.75 per set) and fifth in hitting percentage (.447). Brunner played eight FIVB events, including once with John Mayer and once with Avery Drost. Brunner and Hyden played five international tournaments, winning a silver to go with a fourth and two fifth place finishes. 2016: Doherty and Mayer played five times on the AVP Tour, winning once and placing third twice. Doherty was third in hitting percentage (.474), fifth in blocks (1.69 per set), ninth in aces (.59 per set) and 10th in kills (6.34 per set). Doherty and Mayer played seven FIVB tournaments with a best of fourth. 2015: Doherty formed a partnership with John Mayer, and the duo's six semifinals in the seven AVP events was the most on Tour. They won in Seattle after knocking off the top three seeds and also finished second three times. Doherty and Mayer ended the year as the Tour's top-ranked pair, and Doherty was second in hitting percentage (.504) and sixth in blocks per set (1.60). They played in six FIVB events, advancing from the qualifier four times, with a best of fifth in Long Beach. 2014: Doherty teamed with Nick Lucena, advancing to five AVP semifinals. The tandem's three title matches were the second most on Tour, but each one ended with a loss to Jake Gibb and Casey Patterson. Doherty ended the year fourth in blocks per set (1.75) and sixth in both kills per set (6.68) and hitting percentage (.419). On the FIVB Tour Doherty and Lucena played in the qualifier for the first five events, and advanced each time winning a silver and bronze medal. They played in a total of nine international events, and their two medals were the second most among American men. 2013: Doherty began playing with Todd Rogers. They finished 17th in the World Championships and had their FIVB season best of ninth in the Grand Slam in Long Beach. Doherty teamed up with Nick Lucena for the Grand Slam in Sao Paulo, and finished fifth. On the AVP Tour Doherty and Rogers placed second in the season opener, and then their other two semifinal appearances both came in the first four events. The duo was the fourth-ranked team on tour, and Doherty ended fifth in blocks per game (1.62) and third in aces per game (.88). 2012: Doherty formed a partnership with Casey Patterson. In two AVP events the duo had a best of fifth. They won their only NVL tournament, defeating Phil Dalhausser and Todd Rogers in the finals. In seven Jose Cuervo events, Doherty and Patterson won twice and had three other podium finishes. 2011: Doherty competed on two domestic tours, playing in four events with three different partners. He placed 17th three times. 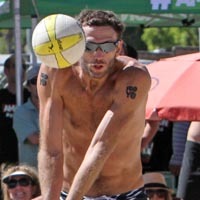 2010: Doherty played in four AVP qualifiers with three different players, with a best of 41st. College: Doherty went to Notre Dame, where he was a pitcher for the baseball team. As a sophomore he was a second-team All America after recording 12 saves (eighth most in NCAA). In his three seasons he tallied 20 saves, good for second most (tied) in Notre Dame history. Personal: Doherty was signed by the Arizona Diamondbacks while in college, and he became the tallest pitcher in minor league history. He played three seasons in the minor leagues (2005-07). Earned the nickname "Avatar" when he moved to Southern California following his baseball career.